WASHINGTON, Aug 21 2013 (IPS) - Bradley Manning, the army private whose leaks of classified information and subsequent prosecution have been the subject of fierce international debate for over three years, was sentenced to 35 years in military prison Wednesday, but his legal team and supporters say they will fight the sentence. Colonel Denise Lind, the sole judge in the case, read Manning’s sentence at the courthouse in Fort Meade, Maryland, near the location where he was being held during trial. She took one day to reach her decision after adjourning a three-week sentencing hearing on Tuesday morning. In early 2010, Manning handed over a trove of classified data from U.S. Army computers to WikiLeaks, the radical pro-transparency group. The latter made the data public, causing scandals for the U.S. and some of its allies. Manning’s supporters argue that he released the information believing he would better society, and they protest that he was unfairly held for an extended time prior to being tried. 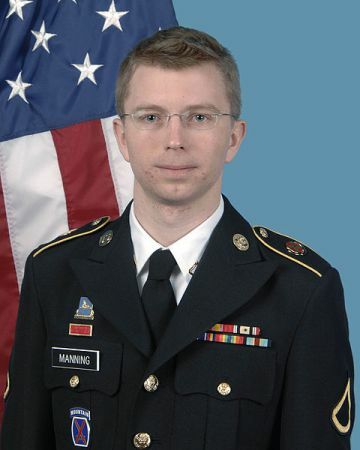 Manning was arrested in May 2010 and has been detained since. Lind announced that this time will be subtracted from his sentence, effectively reducing it by nearly 1,300 days. The judge convicted him on Jul. 30 of six violations of the federal Espionage Act, as well as 14 other charges of theft and fraud. The maximum sentence Manning faced would have been 90 years. Kevin Gosztola, a blogger for firedoglake.com who supports Manning and covered his trial, told IPS that the possibility remains open that the 25-year-old soldier could be freed before he turns 40. By regulation, he is eligible for parole after serving 10 years of his sentence, minus the discounted pre-trial confinement days. “I think this shows that the judge was responsive to the defence’s plea to allow [Manning] a life after prison,” Gosztola says. Manning’s attorney, David Coomb, questions the severity of the sentence. Speaking with reporters after the sentence was handed down, he noted that he has seen lighter punishments for military clients he has defended who have murdered people or molested children. Fuller says the next step for those who oppose Manning’s imprisonment will be to lobby Major General Jeffrey Buchanan, the military commander in charge of the district, to reduce the sentence. According to Fuller, Buchanan has “full latitude” in his ability to soften the sentence, if he chooses. If the effort to sway Buchanan fails, Manning’s legal team will pursue the military appeals process and take advantage of available yearly sentencing reviews by a military parole and clemency board. His support network will also try to convince U.S. President Barack Obama to commute the sentence. A demonstration outside the White House is planned for Wednesday evening. The data Manning leaked included 470,000 battlefield reports from the wars in Iraq and Afghanistan, along with 250,000 State Department diplomatic cables. Perhaps most notorious of the data released was a video titled “Collateral Murder”, which contained footage taken by a U.S. Army helicopter crew as it gunned down a group of Iraqis standing on a Baghdad street and continued firing as passers-by attempted to rescue them. In the video, U.S. soldiers engaged in the killing can be heard laughing. Manning’s actions divided popular opinion in the U.S., as some praised him as a hero and others excoriated him as a traitor. “He was really hoping to change the world for the better,” Deborah Van Poolen, an artist who attended Manning’s trial and claims to have been “inspired” by his actions, told IPS. “He is not a whistleblower or a hero. [His leaks] tarnished the image of the U.S. at a sensitive time,” Steven Bucci, director of the Foreign Policy Center at the Heritage Foundation, a right-wing think tank here, told IPS, adding that Manning should be considered the “biggest spy [the U.S. has] ever had”. Sympathy for Manning was more widespread outside the U.S., coming especially from those critical of U.S. policy, and over the past three years movements around the world have advocated for his release. A campaign has even been started promoting Manning as a candidate for the Nobel Peace Prize, and last week a U.S. human rights group delivered a petition with 100,000 signatures to the Norwegian Nobel Committee, which decides the winner. Defence attorneys for Manning did not attempt to argue that their client acted as a hero, however, portraying him instead as naïve and telling the court that he was a “young man capable of being redeemed”. “Perhaps his biggest crime was that he cared about the loss of life that he was seeing and couldn’t ignore it,” defence attorney David Coombs, who will remain as Manning’s attorney, told the judge during the sentencing hearing. In his own testimony, Manning said he regretted his actions. The prosecution argued that Manning’s leaks strengthened enemies of the United States and put at risk the lives of U.S. soldiers and diplomats living abroad. “There may not be a soldier in the history of the army who displayed such an extreme disregard [for his duty],” prosecutor Capt. Joe Morrow argued. Before the conviction was handed down, the prosecution had argued that Manning was guilty of “aiding the enemy”, a crime which could have resulted in a life sentence for the young soldier, and, many feared, an extreme precedent for punishing information leaks. The judge did not convict Manning of “aiding the enemy”, but still some believe Manning’s case is intended to serve as a warning to future whistleblowers. “Manning’s treatment has been intended to send a signal to people of conscience in the U.S. government who might seek to bring wrongdoing to light,” Julian Assange, a founder of WikiLeaks, said in a statement.